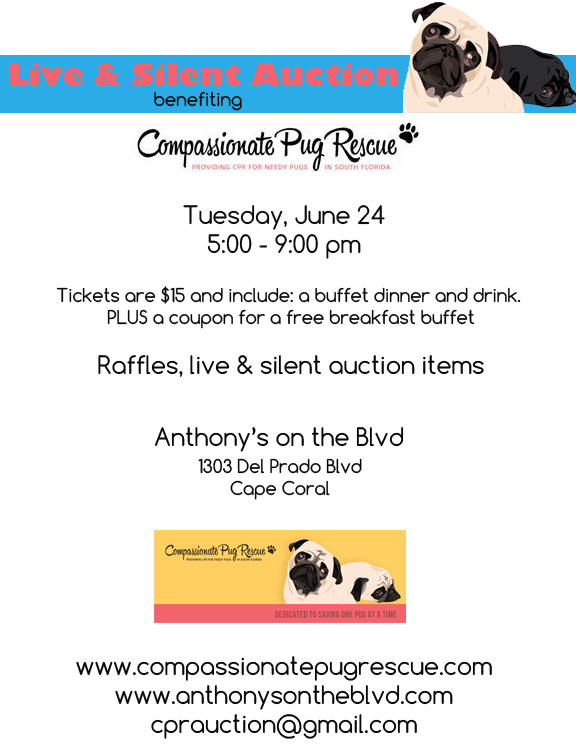 Join Compassionate Pug Rescue for Dinner & Auction Night! Tickets to the event are only $15, which includes a buffet dinner and drink the evening of the auction plus a coupon for a FREE Sunday breakfast buffet! We wish all of CPR’s followers could make it to the event, but If you can’t attend and would still like to support CPR, please consider purchasing a ticket for the event anyway! 100% of the proceeds will go directly to the care of the pugs of CPR. For more information about CPR and our pugs, please visitwww.compassionatepugrescue.com. Have an item or service that you’d like to donate to CPR for the auction? Let us know! 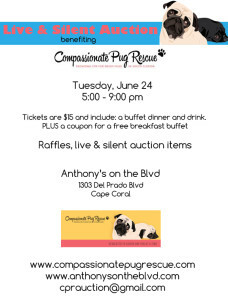 Send email to: contact@compassionatepugrescue.com or send us a message on Facebook! For more info, visit Anthony’s on the Blvd website! See you there!